It’s no secret that flying in Canada has become an increasingly aggravating experience. With long security lines, cramped seats, the disappearing value of loyalty points, and bloated fees for everything from the first checked bag to a seat in the spacious emergency row, it’s hard not to dread that upcoming flight. But at least you can count on your airline getting you there on time, right? Well, not so fast. On-time performance of Canadian airlines has long been a problem, and there’s no sign it’s getting any better. Back in 2012, national carrier Air Canada’s on-time rate across all of its flights, both domestic and international, was a dismal 61%, among the absolute worst in the industry across all major international carriers (where “on time” means that the flight arrived at the gate within 15 minutes of its scheduled time). Compare that to leader Japan Airlines’ 90% on-time rate and you can see why Canadian travelers are so jealous of their international counterparts. And while weather is certainly a major factor when traveling in and out of Canada — causing about half of all delayed arrivals — much of the rest is due to issues very much within an airline’s control, like mechanical problems or scheduling and crew mix-ups. To see how bad life really is for the Canadian flier, we dug into the numbers to see not only how Canadian airlines stack up against one another, but also which airports and routes in this country have the worst on-time performance. We compiled six months of data from FlightStats covering flights along Canada’s major domestic routes, which join nine of the busiest airports in the country (Toronto Pearson, Vancouver, Calgary, Montreal, Edmonton, Ottawa, Winnipeg, Halifax and Quebec City). Sunwing Airlines has by far the worst on-time performance for flights along these major domestic routes, at an absolutely miserable 63.1%. No other carrier is even close. The discount airline is known primarily for its leisure trips down to sunny destinations in Mexico and the Caribbean, but it operated nearly 500 flights within Canada in the second half of 2015 as well. When you look at the popular Toronto to Vancouver route, which is dominated by heavyweights Air Canada and Westjet, it seems like Sunwing just isn’t even trying, achieving a laughable 32% on-time rate, with an average delay on those flights of 52 minutes! And just in case you’re wondering whether it was just the wintry holidays hitting Sunwing particularly hard, the airline had just a 64% on-time rate even when you exclude the last two months of the year. 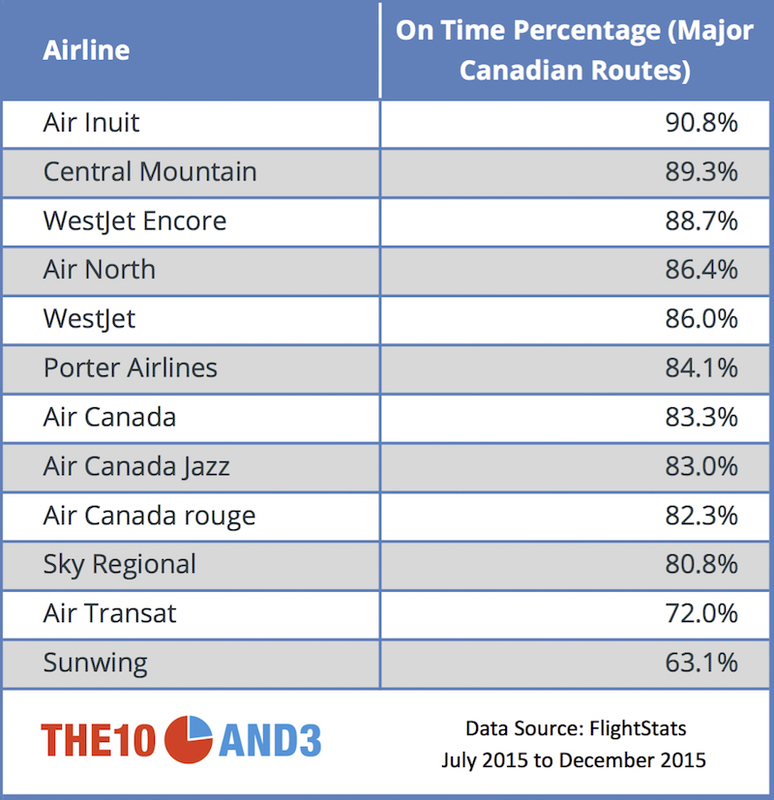 On the other hand, Air Inuit, a regional carrier that primarily serves small destinations in Nunavut and northern Quebec, had the best on-time performance for the major airports that we considered, at 90.8%, but these flights cover only the Montreal to Quebec City route (Air Inuit’s only major route). The best medium-to-large sized airline was Westjet Encore at 88.7% on-time. Though Westjet Encore is considered a regional airline and a subsidiary of the much larger Westjet, it regularly flies a wide variety of routes (Edmonton to Calgary, Montreal to Toronto, Halifax to Ottawa), and will start dipping its toes outside of Canada for the first time in March, flying to Boston. And how about the big boys, Westjet and Air Canada? Westjet comes out on top for flights between these major Canadian airports, arriving on time a respectable 86.0% of the time compared to Air Canada’s 83.3% (note that we’re not considering these airlines’ on-time rates for international destinations here). Westjet emphatically outperforms Air Canada on long cross-country trips like Montreal to Vancouver or Calgary to Toronto, although Westjet’s on-time edge mostly evaporates on short haul trips like Toronto to Montreal. Not surprisingly, Canada’s busiest airport also tends to have the worst on-time performance. Flights in and out of YYZ to other major Canadian destinations arrived on time just 81.5% of the time, with an average delay of 18 minutes. The worst performing route in and out of Toronto? Flying from YYZ to YYC (Calgary) is particularly painful. Both Westjet and Air Canada serve that busy corridor, and with almost 4000 flights between them in the second half of 2015, just 71% arrived in Calgary on time. On the other hand, hopping a flight to YOW (Ottawa) from Toronto is a relative breeze, arriving on time for over 88% of the trips. On the other hand, fliers in Edmonton have it pretty good, with an overall on-time rate of 88.1% in and out of YEG along the major routes. Take your pick of destinations: Halifax, Ottawa, Vancouver. You’ll get there on time over 90% of the time to these cities (and it’s not too bad going anywhere else, too). And as we discovered in our traffic study last year, since Edmonton’s traffic is actually quite mild for a city of its size, Canadian transportation officials should be looking at The Big E for some inspiration. The dataset includes every commercial flight by a Canadian airline over the six-month period from July to December 2015, between the following nine major Canadian airports: Toronto (YYZ), Vancouver (YYV), Calgary (YYC), Montreal (YUL), Edmonton (YEG), Ottawa (YOW), Winnipeg (YWG), Halifax (YHZ) and Quebec City (YQB). A flight is considered “on time” if it arrives within 15 minutes of its scheduled arrival time. Don’t miss our newest graphics, maps and stories about Canada! Follow The 10 and 3 on Facebook or Twitter for the latest news and analysis.